A Critical Self-Assessment on my Personal Journey in Transpersonal Psychology: The Development of Myself. There is a painting by Rene Magritte that caught my imagination as a child, and sparked my interest in the paranormal. 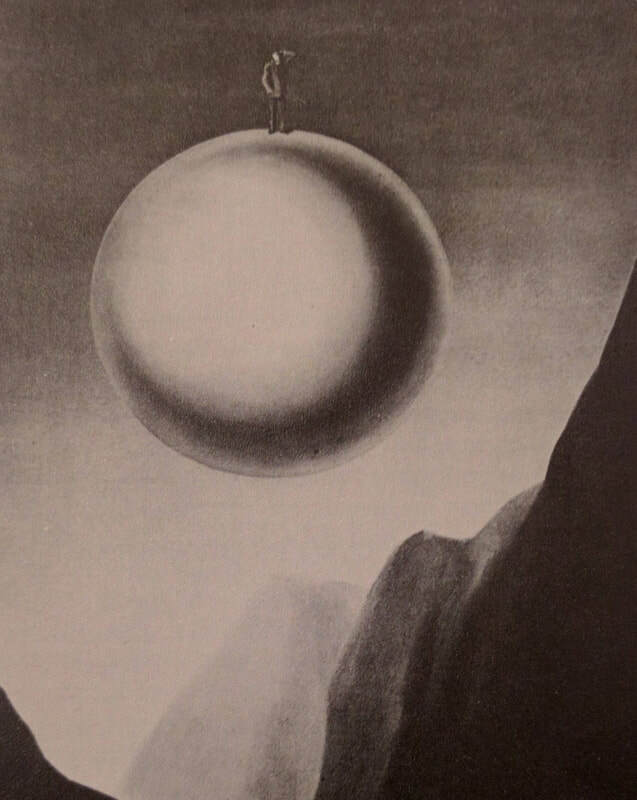 The painting is called ‘The Infinite Search’ (1953) and it depicts in surrealist style, a large floating orb over a mountainous region, and upon the top of the orb, a man standing with his hand to his head looking out or searching the horizon. ​I was eight-years-old when I first saw this picture, which I found in an old worn Reader’s Digest book called ‘Mysteries of the Unexplained’ (1982). This book which is still in my possession today, made me start to ask questions about the nature of the world around me and it also began my own personal search into a subject that would continue to intrigue me throughout my life. Being the youngest of three with an age gap of six years to my closest sibling, my childhood involved a lot of solo imaginative play, favourite roles included being an explorer (mainly of the shed in the back garden) or as a knight on a quest (equipped with homemade cardboard sword and shield). I was dressed like Indiana Jones and was searching for an object of great importance; I entered what looked like a normal suburban corner shop but at the end of the shop (by the frozen pea selection), was a doorway that led into a tunnel, and somehow, I knew that the object I was looking for was down there. It is at this point where the dream would change; the first time I had this dream, around the age of nine-years-old, I went down the tunnel and was attacked by a number of soldiers waiting for me. This dream would always end this way, until at some point when I had this dream again a year or so later, as soon as I got to the frozen peas selection I stopped and realised that I had been here before and knew that there were soldiers waiting for me at the end of the tunnel. With this new knowledge I was able to anticipate their attack and found another doorway. The realisation in the dream was of not being in a dream state or being able to control it, as found in lucid dreaming, but of the sense of being in that situation before such as dream deja vu (dressed as Indiana Jones looking down a tunnel next to some peas). Though in this new dream when I walked back up the tunnel a large boulder blocked by escape and I would wake up. I do not remember any significant events that happened in the waking world to change the rules of this dream. However after a couple of years of being trapped by the boulder, the dream changed again, and again I knew what was going to happen. The last time I had this dream, around the age of 12-years-old, I had managed to escape the shop with the object that I had been searching for. At the time of this dream and up to just last year, I was of the mind-set that it was only a dream, albeit it a weird one, but still just a dream. It has only been with my recent introduction to Transpersonal Psychology and works by Ken Wilber and Carl Jung that I have started to question the meaning of this dream. From examining Wilber’s Spectrum of Consciousness (1977, 1997) model when I first had this dream at the age of nine I could fit my self-development into Fulcrum 4 The role/rule self. At this stage, the learning of concepts such as belonging to a group and group membership could be expressed in the dream as the Indiana Jones explorer persona, a connection to my childhood role-playing and fantasies, a personal trait of being curious, adventurous and always asking questions. As for the important object (a wooden statue) this I believe could be the interpretation of the next Fulcrum, Fulcrum 5 the development of the Mature Ego. By being able to overcome certain challenges (e.g. soldiers and boulder resenting societal rules and moving to a world centred self), I would be able to reach a level of ego awareness and thought reflection. As for the realisation points within the dream, although harder to explain, they could come down to the changes in my thought awareness and understanding that I can take different paths, (my own paths) and that there are different ways of thinking, not just the ways used by my parents. Although transpersonal psychology has been a recent arrival in my life, I found that I had already tried certain aspects of the discipline, such as mediation, before. Although on reunification with the practice, I found it more difficult this time round. This difficulty, I believe, could be due to the memories and circumstances surrounding the first time I tried this exercise. Every time I started the process on internal stillness, past events would enter my mind and I would find myself fighting with emotionally charged memories. My thoughts would revert to when I was 16-years-old, I had just broken up with someone who I thought at the time was the love of my life then fell into a deep depression. Using Carl Jung’s (1921) personality type model, before this event I would of class myself as an extrovert, dominant thinking with a judgment dimension (EXTJ). But afterwards the mature ego I had developed started to unravel, and I retreated from my family, my friends and the world, and became an introverted, dominant thinking with a perception dimension (INTP). Going ‘into myself’ I would spend hours writing my thoughts and feelings down in scrap books, and I started to write poetry and song lyrics, the central theme surrounding my internal pain of the breakup. I started to reflect on my actions, my feelings and how people saw me. By the end of this period, which lasted for 5 years, I started to become aware that I might have lost something of myself, lost my sense of self and it was at this point, aged 21, I turned to meditation and started a BSc degree in Psychology. With no knowledge on the art of meditation I purchased a book that a close friend recommended; Learn to Meditate by David Fontana (1998). The practices in this book are directed towards a more Zen Buddhism path and the subjective meditation of Soto (sitting meditation focusing on inner states). It discusses the journey that you can take to cross the ‘gateless gate’ and gives instruction in how to prepare yourself. I found that it required a lot of patience to meditate, and I surprised myself that I had that patience. ​I found it hard to hear some of the things that were being said in my mind and I would push them away as they would be too emotionally distressing, but after a while I started to listen to what my mind was saying. I started to find ways of accepting what was being said. I would start a session by just sitting quietly, focusing on my breath as it moved through my nose, then I would start to visualise a flowing river, at first it would be fast running and erratic, and within this river I would see different memories and feelings jump in and out of it like fish, after some time the flow would start to soften and slow and less fish would jump out. On many occasions I would notice that I would lose feeling in my left hand, not alarmed I would just accept the experience. It didn’t happen overnight but after a year or so I started to regain some of the confidence about myself that I had lost and I also started to learn new things about myself, strengths that I never knew I had, and the ability to face a number of known fears. One of my greatest fears throughout my childhood and up to the end of my teens was the fear of my dyslexia. Anxiety attacks when having to read out loud in class or having a limited number of choices in my vocabulary for writing assignments. This fear situated well within my conscious ego and I remember taking any alterative decisions for it not to be uncovered, by doing this my fear choices influenced the direction of my early life. It was not until the beginning of my twenties and the reawakening from my depression that I faced this fear. With the returning of my confidence though meditation I started to focus on growing choices such as a path of academic studies, although scared stiff, I did it anyway and earned a BSc Psychology degree from the Open University. As I took the stage to receive my degree it became one of the proudest moments of my life and something that could be described as a peak experience (coined by Abraham Maslow (1954, 1970), the intense feeling of happiness and awe was overwhelming. As I started to face these conscious fears I also started to discover new ones, one though meditation. In one of my sessions I had managed to slow the river of my mind to a point that I had never achieved before, and it appears the water had turned to ice. Fish remained underneath the ice but were now unable to breach the surface. Accepting how my experience had changed I started briefly to sense my visualisations becoming darker, in the sense of them dimming down. A great feeling of loss or loneliness swept over me and then a bright light came, and I opened my eyes. At first, I felt a conflicting feeling of calm confusion, ‘how had the meditation ended?’ and I then noticed that the session had lasted longer than expected. After a short feeling of excitement due to the missing of time, I started to think and write about the last things I remember about the session; the ice, the dimming, feeling of loneliness and the light. For I long time I had no answer for what had happened until I can across in my studies; The Archetypes and the Collective Unconscious by Carl Jung (1959) and his description of the Shadow. This is a part within the personal unconscious where aspects of our self that we cannot accept dwell (both negative and positive qualities). 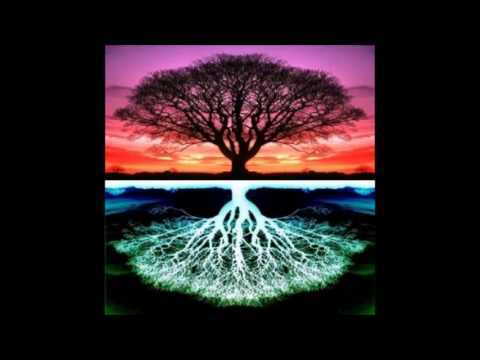 On reading Jung’s description of darkness as a metaphor for the hidden and the unacknowledged, of the shadow and light being the symbol for consciousness, this sent me back to the memories of that meditative session. Although Jung stated that the shadow can force its way into consciousness via projection, I had experienced this fear of loneliness by tapping into my unconscious, not by recognising it from a projection. On personal reflection when trying to understand what I experienced, I concluded that I briefly touched on an aspect that dwells with my Shadow and bought it into my consciousness, although it did take a while to decipher its meaning. That this aspect could have been born out of my earlier depression, and that I exiled it to my shadow as at that time I could not face it. Although not fully understanding this conclusion I took it upon myself to try and spend more time reflecting on my thoughts. I went back to my old diaries and scrap books that I consciously had been avoiding and started to try and make sense of what I had written. From reviewing what I had experienced though those years I noticed that although I had come a long way in repairing my mature ego I was still searching for something, as my day to day activities were mundane and I was yearning for something else, though I did not know what or where to start looking. I had it in my mind for some time that it was something I could find in the external world, the material world, but I was wrong. It was not until I made the decision to go travelling to New Zealand alone for a few months that I started to understand what I was searching for. The time I spent travelling around New Zealand taught me a lot about who I was, my strengths my weaknesses, and more importantly, I started to love myself again. I felt comfortable with what was happening in my life and started to accept who I was. I would say that this realisation was first felt while just driving down a quiet road near Twizel (South Island) one early morning, with no one around for miles, an open road and a green mountainous backdrop. All of a sudden I felt an overwhelming feeling of joy and had to stop the car. I don’t know where it came from, but I remember just hugging myself and laughing. I felt that I had just let go of a heavy weight and that I somehow knew the future would be brighter, (Another peak experience, maybe triggered by the natural scenery of where I was and how I was feeling at the time (natural scenery 18% trigger found in Margarita Laski Study (1961)). After this experience and my return home, I actively changed nearly everything in my life; I changed my career, joined a number of clubs and societies (e.g. The London Ghost Club, SPR) and started to meet new people. I turned back into an extrovert, dominant thinking, but with a perception dimension (EXTP). I started an MSc in Parapsychology, got promoted at work, moved to London and met a person, who for the first time stopped the searching need that I remember feeling since childhood. I trusted my instincts and listened to the small voice in my head, I don’t let fears stop me from experiencing new things and accept all that I am, although at times I still entertain personal doubts. From using Maslow’s model, I would place my self-development on the steps towards Self-Actualisation, though with a number of lessons still yet to be learnt. Moving away from past events, although I tried meditation again for my study in transpersonal psychology, I found that these sessions did not bring with it the feeling of calm and stillness that I experienced the first time round. My recent experiences seemed to leave me with a sense that I was only meditating due to the need of the study, not because of any personal need for knowledge or search for growth. Although I did not start out with this mind-set, this feeling became stronger as time went on. The first time I used meditation I was desperately searching; now I feel content with more aspects of myself. Though I did find great interest and intrigue in examining my dreams and trying to analyse their meaning. 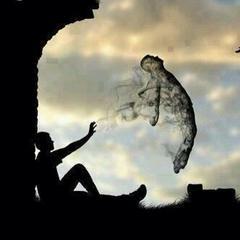 Since childhood I would say that I have experienced many vivid dreams and lucid dreams now and then. 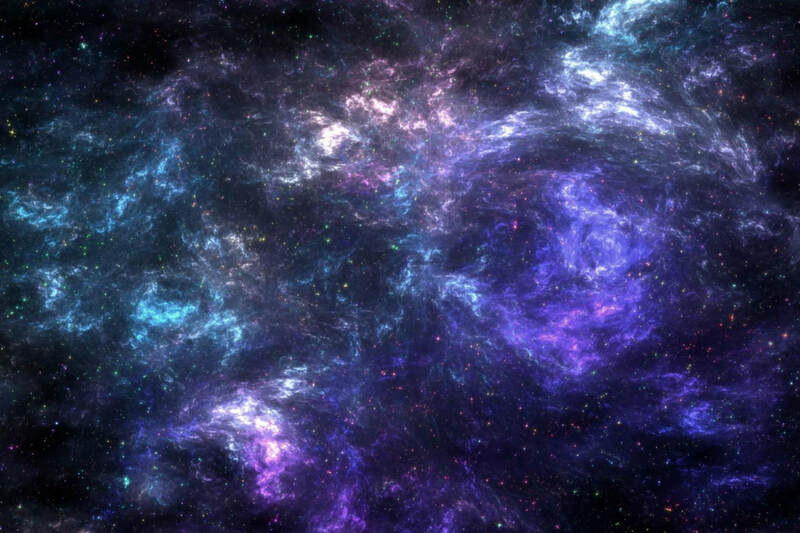 I never tried to find meaning in my dreams before, although I understood the Jungian concept that they could represent unconscious elements trying to break into conscious thought. There are two dreams that I have recently experienced that I feel are significant to my present state of self-development. I’m at work (an insurance company) which is doubling as a hospital. I walked into the claims department, which opened up into a large hall with a high ceiling. The department is located on the second floor and has a glass balcony that looks down onto a courtyard. I walked towards the glass balcony and looked down into the courtyard; it is made up of large white stones and had some green plants growing in flower beds along the sides. After taking in the view I noticed that the Pope was in the courtyard with a number of guards around him, from seeing this I knew that the Pope was coming to the hospital to have his teeth cleaned. Turning around I walked out of the claims department and towards reception, where I came across a lot of homeless people lying on the floor and around the lift. They were eating pigeons, not cooked pigeons but raw pigeons; I looked around and saw feathers and blood everywhere, up the walls, along the tables, the seats, and the floor – it was everywhere. I pressed the button for the lift and as the door opens the floor was covered in blood and feathers and parts of dead pigeons. I then woke up. The cameo appearance of the Pope coming to my office to have his teeth cleaned, could be seen as part spiritual (Pope), part cleansing (teeth clean) – and going down to reception to meet him could show my willingness to experience this spiritual cleansing. Though on my arrival I fail at the first hurdle as I cannot cross the space from matter (blood & feathers) to spirit (the front doors, to meet the Pope), I turn and try to go back up to the safety of the office, a place that I know, a place where I can only look down on spirituality from behind a glass window. This could represent my internal struggle to want to become more spiritual and open (crossing to Wilber’s stage of the Centauric Self) but fighting against the rule systems of my mature ego (body and matter). I was in a long, dark tunnel; on one side were a number of large round doors leading into different houses, the doors were on a raised path with a hand railing that ran the length of the tunnel. On the other side was a muddy path or road. Viewing myself in the third person I walked out from one of the round doors into the middle of the tunnel and was met by a black house cat. It looked at me as I got into a car and watched me as I slowly drove past it down the tunnel. I noticed that I passed several different cats on my journey down the tunnel, always looking at me. The car slowed (I feel I was not driving it, just sitting in it) as it arrived at the mouth of the tunnel blocked by a very large door reaching from the floor to the ceiling. As I tried to open the door I turned and looked behind me, and all the cats that I saw on my journey down the tunnel were now sitting behind me looking at what I was doing. After some time I finally opened the large door and got back into the car and left the tunnel, and started driving into a dark woodland. As I looked back in the mirror I noticed that the tunnel was built into a side of a very large mountain. For some reason I stopped the car and got out, I started to walk back to the tunnel. When I got to the entrance, the tunnel was starting to fill up with water that was pouring in from vents on the sides (knee high) and I could not see the cats anymore. I started to head back to the house that I started the dream in. As I reached the door I turn and on the opposite side of the tunnel, sitting on one of the vents was a grey cat watching me. As I walked towards it I woke up. The tunnel in this dream could represent my life’s path and the doors are the different events that have taken, or are taking, place in my life. If the door is open this means that there is something still left to do with that event – unfinished business. If the door is closed this means that that event is complete. Since childhood there has always been a cat in my life, a cat has always been a family pet. I believe that the cats in my dream may represent parts of my own psyche linked with the events of the open doors (using the visualisation of the animal that as a child I formed a bond or group with). I do not look into any of the open rooms as I pass only taking note of the different types of cats in the tunnel, this could show that I may be trying to put off dealing with the events that need my attention. All I focus on during the journey down the tunnel is the cats watching me, (like I’m waiting for myself to do something, start something) when I reach the large door at the end of the tunnel I have to use a lot of force to move it. I’m trying to escape my tunnel (my life) while the cats watch (different parts of me watching). Although I do escape, I turn back, like I know that I have to face the issues behind those doors, and deal with the events as no one else will. Just leaving them unfinished is not an option and that they need to be faced in order to walk away from the tunnel without having to turn back. The tunnel filling with water could warn that there is a time limit, so on finding the first door and opening it I see the first cat and head towards it, this could mean that I am now moving with purpose and the starting point to deal with is this room, this event is to get to the cat (the part of me that is connected to that issue). I believe that the first dream, although disturbing at the time, it is the personal reflection that still throws me into deep contemplation. The division found within myself, wanting to continue my steps towards self-actualisations and the spiritual self, but still clinging to the safely of the rule learnt by the mature ego - I may want to follow the spiritual path but may not be ready to do so. As for the second dream this tells me that there are many issues in my life or many lessons still yet to be learnt and I cannot ignore them, that only through understanding events within yourself and your life can personal growth and enlightenment be achieved. Completing the matrix requires you to fill in the empty squares with words that at first seem random and only superficially linked, but as you go through the process you start to become aware that the link words may have deeper meanings. The first two stages of the matrix (the words outside the box) are represented in this modal as aspects that might refer to sensory experiences and features that could be preoccupying your mind at the time of taking part in the exercise. The words inside the box at each corner may indicate significant personal interests or aversions. Using this description ‘growth’ would be a strong personal interest (learning and experience new events and lessons) and ‘fire’ an aversion (the pain of being burnt or being out of control like some fires). The words between these corner boxes are representations for psychological dynamics of change and development. Using this illustration, the word ‘fear’ could be seen as the feeling that consciously continues to be my companion in life but with its role and influence changing as my journey develops. The two inner words of ‘summer’ (hot, happy, relaxed and fun) and ‘rejection’ (painful, risk taking, emotional and past) represent elements of opposition or support for personal development and the middle word ‘rain’ (flowing) representing the realisation of an ultimate value or condition. The exercise helps you to explore the dynamics behind the meaning of these words, both as the word itself and as a symbol. Within this matrix the word ‘sociable’ represents my Giant (Progression), my driving force, a feature that carries me forward. Reflecting on the meaning of this word, I initially explored the aspects of networking and connecting socially to both internal and external humanity, a driving force to be part of the social world, to belong to a group (small or large). This belonging feeling could be linked with the searching need I have experienced for a large part of my early life. The word ‘heat’ is my Dwarf (Regression), standing for my inertial tendencies, source of weakness or a feature that is holding me back. Heat to me is an aspect of warmth and that it is my warm that is my weakness. My warmth or over emotional state that needs to be controlled in order for my growth, such as allowing individuals to walk over me or to act on emotion impulses, these elements may inhibit my understanding. The word that signifies my Soul and is my basic inner personality is ‘fear’ (Inwardness). Initially I thought about my insecurities and my anxieties being the meaning behind this word but as I explored it deeper I started to view fear as being very powerful and not necessarily having to be negative. Fear is an emotion that can heighten the senses and focus the mind. It can stop you from taking dangerous risks; alert you to conditions that might be overlooked and can help ready yourself for any situation. For my Persona, the principle of Outwardness and the way that I express myself publicly, my word is ‘romance’. Examining this I could say that as I do not think of myself as a romantic, but I enjoy the idea of it, this could be why it has developed into one of my many pubic masks. The word that represents my Guide (Inner Progression) is ‘growth’, this is my unconscious power. Reflecting on this word conjures up many meanings such as growth in the sense of a thirst; for knowledge, for spiritual awareness, for social connections or taking on new experiences, new meanings, and new understandings. As for my ego-ideals or conscious value my Imago (Outer Progression) is ‘Weekend’. This to me symbolises a time or space for spending with yourself, it is about making time for the events that you want to experience. This value of self-company helps to achieve self-reflection and self-awareness. My Shadow in this matrix is represented by the word ‘fire’. This is my hidden side, qualities that have been failed to develop or not accepted by my ego, (Inner Regression). Fire to me signifies being out of control or losing my control over my life or mind. I have found that often when I interact with individuals that may be mentally unwell I find myself feeling fearful or untrusting of that person, even though they do not show any of these behaviours. This could be my projection of the fire, my dislike and inability to accept loss of personal control. The word ‘love’ is my Spectre (Outer Regression). My conscious dislike or areas that help is needed. As love is a feeling, in my past I would often keep my feelings (especially love) very close and protected, this emotional wall would allowed me to hide behind my persona’s and no one would know what I was really feeling, but recently this wall has started to be removed. Due to hiding my feeling for so long I find that sometimes I do have difficulties in expressing myself emotionally and that it’s hard for me to talk about feelings, this is an area that certainly does require improvement and help. My Station (Inner-Outer Balance), my basic approach to life is represented as the word ‘rejection’. This part of my personality could have evolved from aspects of my early teen life when I was learning the roles of being part of a group and then being rejected by it. The word could illustrate why I’m often self-critical of my work and try and push myself on, to always try and do better and not be turned away by my peers. My Battle (Progressive-Regression Tension) is represent using the word ‘summer’. To examine this area of moral conflict, summer could symbolise the battle between wanting to relax and enjoy the warmth of my familiar experiences, to be content with want I have and the wanting to continually push myself into new experiences that I may find uncomfortable in order to achieve a deeper understanding of my life and myself. To accept ones failings, but not to accept that they are static and unchanging, that I can turn them into strengths. My Destiny, my anticipated final outcome is represented as the word ‘rain’ (Final Resolution). My first reaction to this word was one of bemusement as rain, as a destiny seem cloudy, depressing and dull, but the more I explored the word the more I started to understand its meaning to me. Rain in essence is water and water is a liquid; flowing and waving, constantly changing. It is not fixed and is only shaped by the container it is in. I believe that a person’s personality or self is like water; fluid and ever changing; it reacts to events in your life and the way that you see yourself, it is shaped by only your boundaries and understanding. Events in my life allowed me to change aspects of myself, that gave me greater understanding of myself within the world, not unlike a single water droplet within a great ocean. 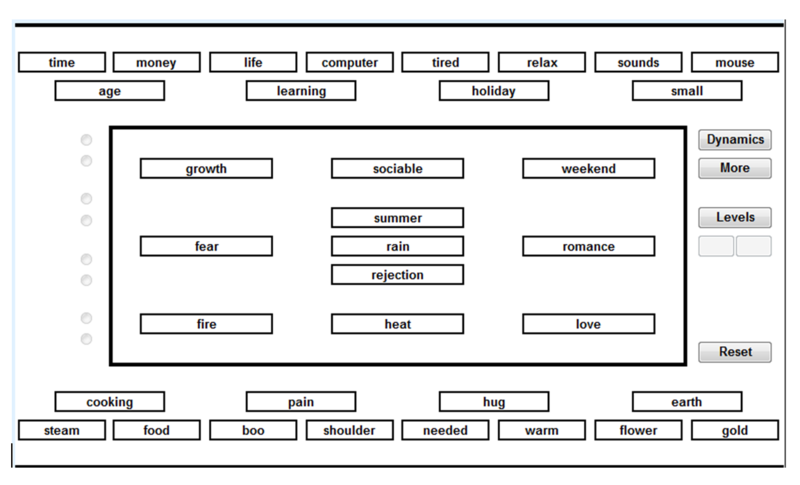 The watchword matrix also allows you to explore what personality type you might be through your understanding and perspective of each word within the box, selecting one word from each pair (Inner or Outer, Feeling or Reason, Concrete or Abstract and Static or Changing) that best describes its meaning, (e.g. Growth = Inner, Reason, Abstract and Changing). Based on research conducted by Carl Jung (1921), personality types can be used to categorize individuals into primary groups of psychological functions. 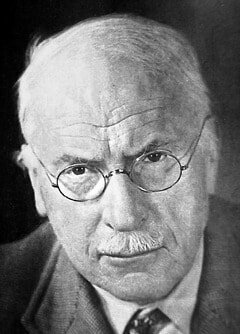 Jung purposed two dichotomous pairs of cognitive functions; one of rational (judging) functions (thinking and feeling) and one of irrational (perceiving) functions (sensing and intuition). Jung states that these functions are expressed in either an introverted or extraverted form. From the matrix exercise I have an Extraverted Intuitive Thinking Perceiving (ENTP) personality type. This type is associated with the qualities of; ingenious, stimulating, quick and outspoken, adept at generating conceptual possibilities and then analysing them strategically, well at reading other people and little patience for individuals who they consider unintelligent or wrongheaded. ENTP are bored by routine and resourceful in solving new and challenging problems (Myers Briggs Foundation). ENTP are also regarded as optimistic but can become petulant about small setbacks and inconveniences, this can be true of my personality (e.g. Initial authorisation of my ethic form for my MSc study rejected, although quickly rectified this event caused great distress at the time). In one week I turn 33–years-old, and in the period from my early twenties to now, I have been able to achieve many of the personal goals that I set for myself, I have been able to discard many of my different personas and let a lot more individuals see my true ego. I could put this change down to the passing of time, of growing older and becoming more comfortable with myself, but I believe that it was down to the many peaks and troughs of myself journey. That by taking time to understand the experiences of both the low and high points of my life, that this can bring great peace and an understanding that life never stops giving, never stays the same and that there are always lessons to learn if you’re ready and willing to learn them. Fontana, D. (1998). 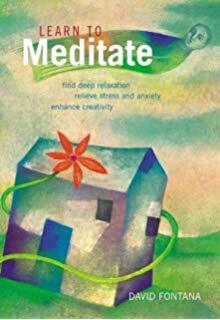 Learn to Meditate: The Art of Tranquillity, Self-Awareness and Insight. Duncan Baird Publishers. London. Maslow, A. (1954). Motivation and personality, New York: Harper & Row. Maslow, A. H. (1970). Motivation and personality (2d ed.). New York: Harper & Row. Wilber, K. (1977). The spectrum of consciousness, Wheaton, IL: Quest.